Available at my official Avon store. Tiny Tillia's Treasuring Photo Tote Bag. Show off your little pride and joy with this 15 1/2" L x 4 1/2" D x 12" H brag bag. 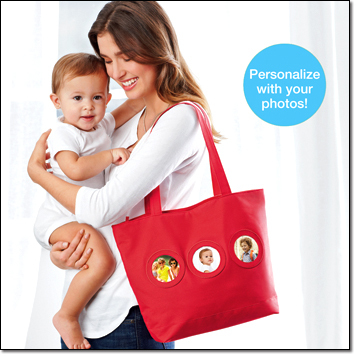 With 3 exterior 2 1/2" diameter photo inserts and an inside pocket. Zips to close. Polyester. Imported. Item#: 515-880 Price: $14.99 MOTHER'S DAY IS MAY 12! You can order online with free shipping offers on my home page at the above link. You pay Avon directly and they ship it directly to you! Make sure you choose direct delivery only! I love this tote bag! I can't believe it's only $14.99 on sale right now!